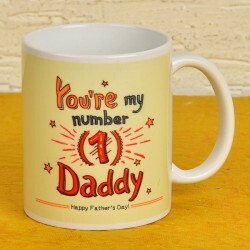 We have a wide spectrum of mugs with personalized photos and quotes for Father's day. 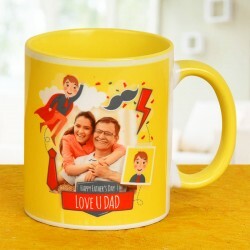 All our mugs will be customized as per your request and will be delivered to your wonderful dads with timely, hassle-free delivery. 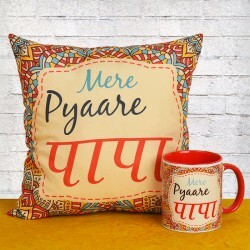 Order now and make beautiful memories with MyFlowerTree. We also see a superhero in our dads and why not ! He is that one person who placed absolute trust in is when we were grappling with self doubt. He took us by the finger and taught us to walk the difficult terrains. It is important that you let him know how much you love him. 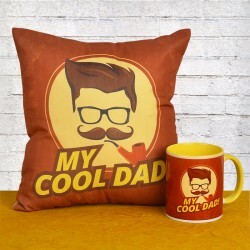 The upcoming Father's Day is likely to have you all confused about what you must bring to your dad that would make him happy like never before. Going from market to market and store to store is likely to waste a lot of time and effort and hardly bring any good results. There is hardly anything better than a gift that is usable and is a thing of beauty at the same time. 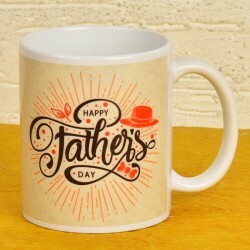 A mug with a Father's day message makes a great solution if you are looking for father's day gift ideas. 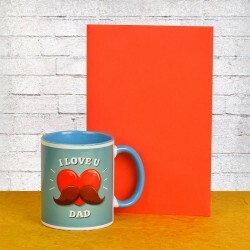 The MyFlowerTree website offers a wide range of mug selection that are perfect for the occasion, and convey how much you love your dear dad just the right way. 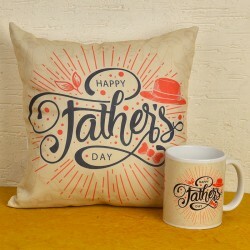 A great option is this The Man Mug that is white in color and has a masculine vibe to it due to its moustache motifs and calligraphy of the font imprinted on it. 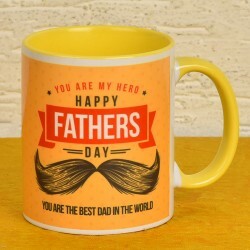 Have a look at our The Hero Mug , which is a beautiful gift that has imprinted on it the exact adage you believe in. 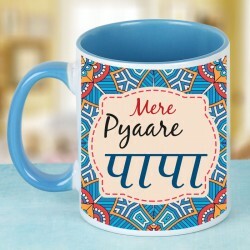 This beautiful white mug has a printed pattern in blue with a quote that celebrates him. 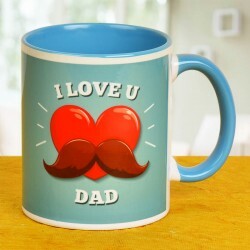 Imagine your Father every morning , with his favourite drink poured in a vessel with a thoughtful message. 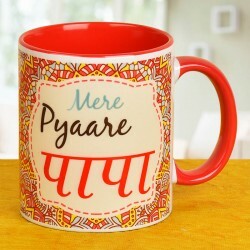 That's the reason why mugs make such wonderful gifting options for fathers. 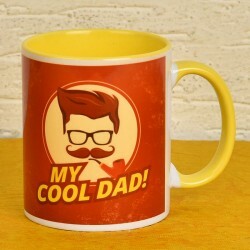 Get your dad a mug that fills rest of his day with pleasant memories of you. 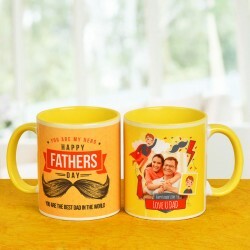 Our cute Father's Day Mugs with Pictures are a great way to revive old memories. Hook your dad to that one memory that you and he has created together. Our mugs are available in different colours and prints. 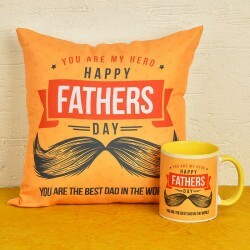 Your immense love for your Dad has inspired us to take initiative and present to you a collection of gifts which will make this Father's Day amazing for the both of you. 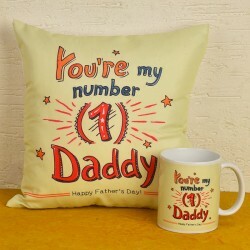 Our website hosts a range of father's day combos that contain fathers day personalised cushion, that can make him feel extra special. 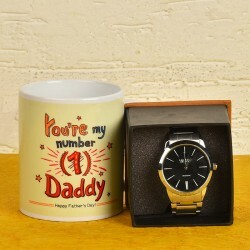 Availing a combo for fathers day allows you to team these Mugs with Flowers, Cakes, Cushion and Other Personalised Gifts. 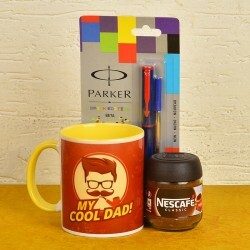 Our All Rounder Dad Hamper is an assortment of one Fathers day themed mug, a greeting card and two snickers chocolate to add to the sweetness of the hamper. 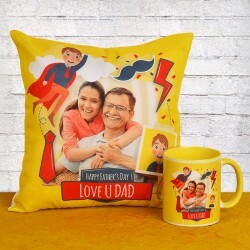 We also have a simpler Adore You Combo has a printed mug that shouts out how much you love your dad in bright prints and a matching 12 by 12 cushion, that will become his bedroom staples when he will receive it as a Father's day gift.